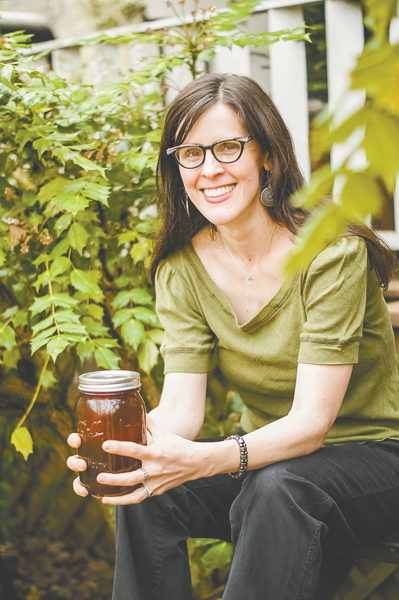 I've been so busy canning that I almost forgot to direct you to my post in this month's Verve, wherein I divulge the origin of my infatuation with the jar. I'm holding honey in the jar above, extracted from my bees this past September. Yet another example of my affinity for putting edibles and delectables in jars. What about you? What got you turned on to the world of simmering pots and tempered glass jars? I'd love to know! I used to watch (and as I got older, help) my mother and grandmother can. Once I had my own place, the canning just continued. There's no way once you eat home canned goods, you can go back to store-bought! I got into canning when my neighbor showed me how to make blueberry jam. In hindsight I realized she didn't properly seal everything, but I think they ate the food too quickly for it to make them sick. After that I was hooked and started experimenting with different types of foods. Now when I'm off someplace and need a drink or food to bring with me, I grab a canning jar and load it up for the trip. I loved my maternal grandparents pantry stacked high with jars. As with all preservers they were generous and we never left their house without at least a couple of jars of lemon curd (my sisters fave) and pickled red cabbage (my fave). I'm getting better at it myself and try something new each year, this year passata though one batch went mouldy. I nearly cried! Great article Ash! Glad to hear Nanny is recovering. Can't imagine her in assisted living but she will make that even fun!!! I' was inspired by you and this lovely blog to begin canning. Purchased the book and away we go! Got the peach lavender butter done and some dill pickles. My family is so excited for us that my daddy bought me a canner and pressure cooker. My brother provided us with 7lbs of green beans and a large bucket of potatoes. It is fun, delightful and rewarding. Look forward to tomatoes, corn, okra....thanks for the inspiration! I will get to those chickens one of these day! oh, also more tomatoes than I know what to do with...trying to get my hot sauce recipe perfected! It all started with wanting to grow our own veggies, as many as we could. As we continued to grow more and more, we had to do something with them before they went bad...enter canning. We now water bath and pressure can and are officially addicted to the process and pride of knowing exactly what is in the food we eat. Well, at least some of the food we eat ;-) There's only so much one can grow in a tiny space! My family all lived on one country lane (aunt and uncle, grandma, and our family), and grandma's basement was the epicenter of summer activity. It was a complete sensory experience; I will never forget the fragrance of a tomato canning day! Jars were just the icing on the cake. I loved finding one of the few blue jars among the plain, clear serviceable ones. Now we have blue jars for flowers, and clear ones filled with jellies and jams and tomatoes!